You have a question? The fastest way to get to your answer is our FAQ section. Maybe you`ll find the answer of your question there. Here you`ll find a lot of information about us. You need help? Watch our Tutorial videos. You will find videos about the ordering process, the functionality of our store, explainer videos and a lot more. -- Please Select --20 mm 22 mm 24 mm 26 mm None of the above. Write down your data in the field "Additional information". -- Please Select --75 mm 80 mm None of the above. Write down your data in the field "Additional information". -- Please Select --115 mm 120 mm 125 mm 130 mm 135 mm None of the above. Write down your data in the field "Additional information". Help - How to order? Fully handmade Watchstrap made of genuine highest quality crocodile leather. We don`t use any machines during the entire production process, even our stitching is done completely by hand. Every strap will be made to measure for the customer. 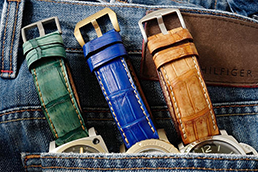 Please note that the grain of the crocodile strap can differ, because every strap is one of a kind and fully handmade. The following illustration shows all the data we need to produce a custom-made watchstrap for your wrist and watch. If you need any help during the ordering process simply click on the tab "Help - How to order?" or watch our "Tutorial - Videos". You don`t know which size you need? Please click on the tab "Sizing guide" to get more help. For more information or help, please don`t hesiate to contact us. 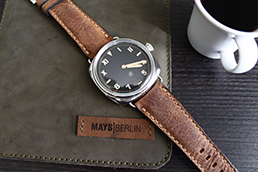 Any type of watch or accessory, even when displayed on the product pictures are not included in any offer of Mays-Berlin and are only displayed for decoration reasons. This guide will describe in detail every piece of fitting information we need to produce a custom-made watchstrap for your wrist and watch. The illustration above shows all the data in detail. Please measure the ludge size of your watch and click on the correct size in the dropdown menu. You can also search the internet to find out your ludge size. If your ludge size is not mentioned in the dropdown menu, please type in your data as the following shema in the field "Additional information" or contact us. Please choose the buckle size of your choice and click on the correct size in the dropdown menu. You can also search the internet to find out your buckle size. 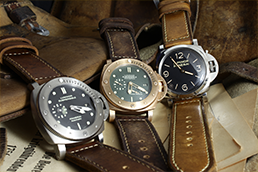 We recommend to order any vintagestrap with an identical size for the ludge and buckle size. This ensures a perfect vintage look and pure comfort. If you want to use your genuine buckle - click on the particular size in the dropdown menu. If your buckle size is not mentioned in the dropdown menu, please type in your data as the following shema in the field "Additional information" or contact us. Please click on the size you want for the short piece of your future watch strap. You can find a reference table for your wrist in our "Sizing guide". If your desired size is not mentioned in the dropdown menu, please type in your data as the following shema in the field "Additional information" or contact us. Please click on the size you want for the long piece of your future watch strap. You can find a reference table for your wrist in our "Sizing guide". If you wish to have a hole in a particular position on your strap, please type in the position of the main hole in mm. Measure from Ludge to the hole center! Please check the illustration for the correct measurement. The position will be used as the middle/center hole. If you wish a different number of holes as mentioned in the product description, please choose your desired number of holes in the dropdown menu. Please choose the buckle of your choice from the dropdown menu. You can see every buckle in detail by clicking on "Equipment" from the main menu bar. Take care to choose a buckle in the same size that you have chosen on point B before. We appreciate individualism, and are always ready to include your custom wishes. Different yarn colour, stitching style, Thickness etc is not problem for us, due to our products being fully handmade. For more information about the collection and how to order - Feel free to contact us. Are your straps really 100 % handmade? Yes, our straps as well as every other product of Maystraps are fully handmade. We even do the suture holes and the stitching ourselves by using classic saddle tools. This way we are able to ensure our high quality standard. We don´t use any kind of machines during our production process. The straps are produced by us, fully handmade in Germany. 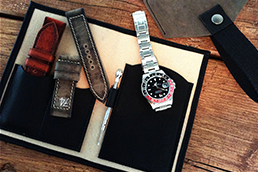 Do you also use exotic leather, such as snake or alligator/crocodile, for your straps? Yes we do in our Crocodile Collection. What kind of information do you need for making the strap? Please click on the tab "Help - How to order?" to find any information you need. Which strap measure is right for me? In this case, there is no right answer as the strap measure depends on the taste and preference of the wearer. Generally speaking, however, our vintage straps should be ordered in oversize. The following table may be used as a reference. However, we would like to point out that we offer no warranty for a perfect strap fitting! The table should merely be used as a reference! As the delivery time is also dependent on our order situation, which varies from time to time, please use the contact form to get in touch with us to find out. Do you have a lineup of products ready which could be ordered and delivered immediately? All our straps are custom-made products. Therefore, we do not have a lineup of prefabricated products. Never miss new products and promotions.